America’s love affair with the automobile is no secret. It’s one shared with arguably every industrialized nation in the world. After all, for most of us, buying and maintaining this second biggest lifetime expense—other than health insurance and care, perhaps—is a passion bordering on obsession. Never mind that cars threaten the environment as well as ourselves. Death by vehicle is the 9th largest cause of such in the world, more than even heart disease. Regardless, our love/hate relationship with them begins from the moment we endure the purchase process, suffer a warranty expiration and, finally, faint at its diminished value at trade in. Like most love affairs, especially those involving technology, cars blind us with promises of a better life while we ignore their pitfalls and contradictions. Whether it’s answering a vibrating smart phone, trusting a virtual assistant—think Alexa or Siri—or answering an auto’s self-parking device, lane departure warnings and blind spot commands, we respond like Pavlov’s dog and are rewarded for our good behavior. And now Intel reports that auto companies that don’t prepare for self-driving vehicles risk failure or extinction as early as 2035, missing out on a projected seven trillion dollar industry. As we ride along into this future of total “auto-nimity”, we may indeed wonder who really is in the driver’s seat. Fortunately, there are those in and outside the industry who are still inspired by the automobile as a means of expression and creativity despite its contradictions. For these visionaries, the auto is more than a means of transportation; it has and will continue to be a lifestyle. 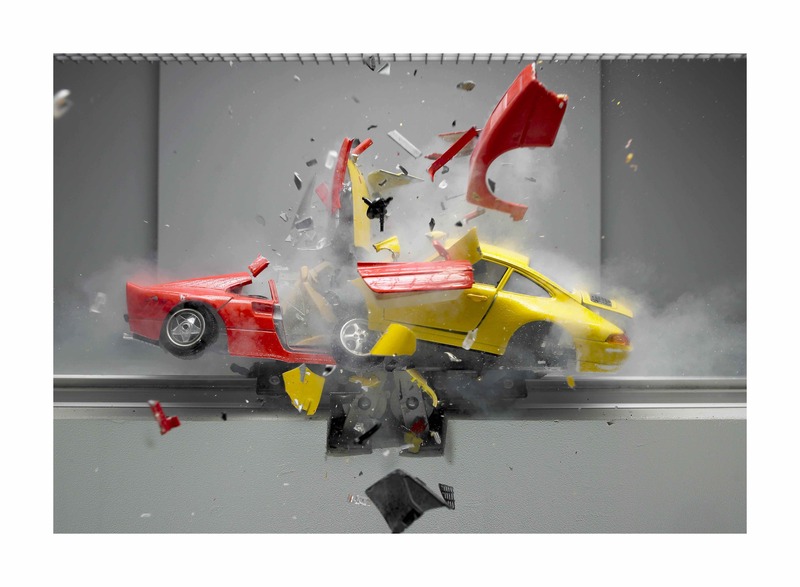 Illustrating the paradoxes of this passion is the aptly titled art exhibition, DRIVE DROVE DRIVEN: Cars in Contemporary Photography, which opens Thursday, Aug. 10 at the Artists’ Cooperative Gallery in the Old Market and continues through Sept. 1O. DRIVE DROVE DRIVEN is organized by Matthias Harder, curator of Berlin’s Helmut Newton Foundation devoted chiefly to its namesake, the late internationally famous photographer. This is Harder’s fourth such exhibit sponsored by Omaha’s Moving Gallery including Portrait: Berlin (2007), Time Death, Beauty (2010) and Wild: Animals in Contemporary Photography (2012). Besides their medium of choice, Harder’s exhibitions are also connected thematically by his interest in the diversity, complexity and paradoxes of world culture as seen in everyday objects such as flowers and animals, and now cars. As such, even as the automobile is responsible for air pollution, rising carbon emissions and traffic-related deaths, nevertheless, it has been the product of eye-catching design from the LaSalle and the Cadillac to the Citroën and the Chrysler Airflow, from the Mercedes and Ferrari to the Corvette and the Thunderbird. Not to mention influential concept cars that continue to forecast even as they highlight annual car shows in Detroit, Geneva, Paris and Los Angeles. Yet, as DRIVE DROVE DRIVEN clearly demonstrates, the automobile is also an inspiration for artists outside the industry, a motif in the work historically of the likes of Andy Warhol, Sylvie Fleury and Gabriel Orozco. In addition, contemporary photographers worldwide have created “iconic images” that depict the auto in all of its cultural, political and social implications. In this exhibition 23 international artists, including two from Omaha, offer 136 diverse photographs of its subject on the road or at rest, neatly parked or abandoned and rusting on the spot, as well as on display at car rallies or just sitting proudly at the curb. Nor does the exhibit shy away from the car’s rep as a mode of wreck and ruin. Artists featured in this “car show” are: Clara Bahlsen (Berlin), Jürgen Baumann (Berlin), Xiomara Bender (Berlin), Beni Bischof (St. Gallen & Widnau, Switzerland), Daniela Comani (Berlin), Stephan Erfurt (Berlin), Larry Ferguson (Omaha), Aris Georgiou (Thessaloniki, Greece), Oliver Godow (Berlin), James Hendrickson (Omaha), Charles Johnstone (New York), Martin Klimas (Dusseldorf), Jens Liebchen (Berlin), Serge Marcel Martinot (Hamburg), Arwed Messner (Berlin), Ralf Meyer (Hamburg), Bernhard Moosbauer (Berlin), Melina Papageorgiou (Berlin), Philipp von Recklinghausen (Berlin), Christian Rothmann (Berlin), Marc Volk (Berlin), Maurice Weiss (Berlin), and Michael Witte (Berlin). Drive Drove Driven continues Harder’s personal preference for cultural contradictions and vagaries, but as in his past exhibitions here in Omaha, the most interesting, commanding images are those that not only run counter to one’s expectations in theme and subject, but on closer inspection, reveal their own point of view and aesthetic. Likewise, in Wild Animals (2012), Harder surprised again by describing his exhibition in terms of “ugly beauty,” referring to the imagery’s edginess as individual works often ran against expectations not only of beauty but animal photography in general. Though the tone and POV varied from the ironic and satiric to the humorous and critical, the work seldom failed to meet his curatorial eye. Similar surprises of counter-culture that fly against the social or artistic norm exist in Drive Drove Driven also, though most eschew the overt irony and edginess of the two above exhibits. Still, these images of automobiles are not run-of-the-mill portraits merely suitable for the pages of Auto & Design or Car and Driver magazines. Instead, the majority of car-centered photographs here must be viewed within their own purview and mise en scène. Their styles and tones are as varied as the vehicles they depict. For example, the work of the two Omaha photographers, Ferguson and Hendrickson, though both in black and white, are a study in contrast. 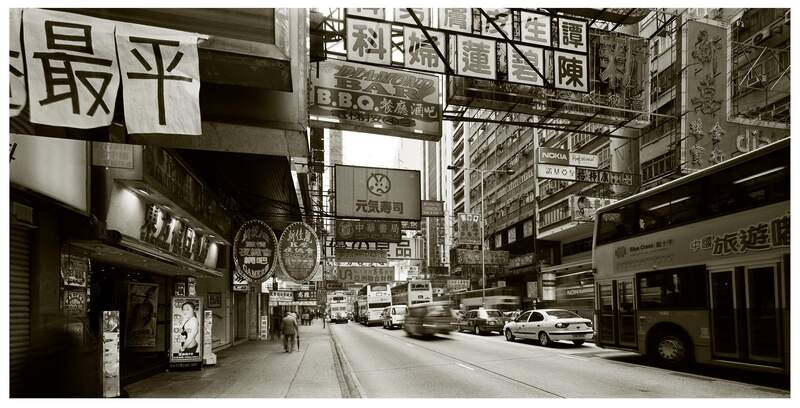 In realistic fashion, Ferguson’s street-level view of a busy Hong Kong street, framed by a similar congestion of overhead signage, is a glossy study in gray and gray…and atmospheric fog. Cars of course responsible only for the former unlike in the very smoggy mainland Beijing. Hendrickson’s image of Nebraska’s Carhenge sculpture transcends the tourist perspective and manages instead an iconic, majestic black and white whose grainy visage references its Stonehenge source both in texture and prominence on an otherwise barren landscape. 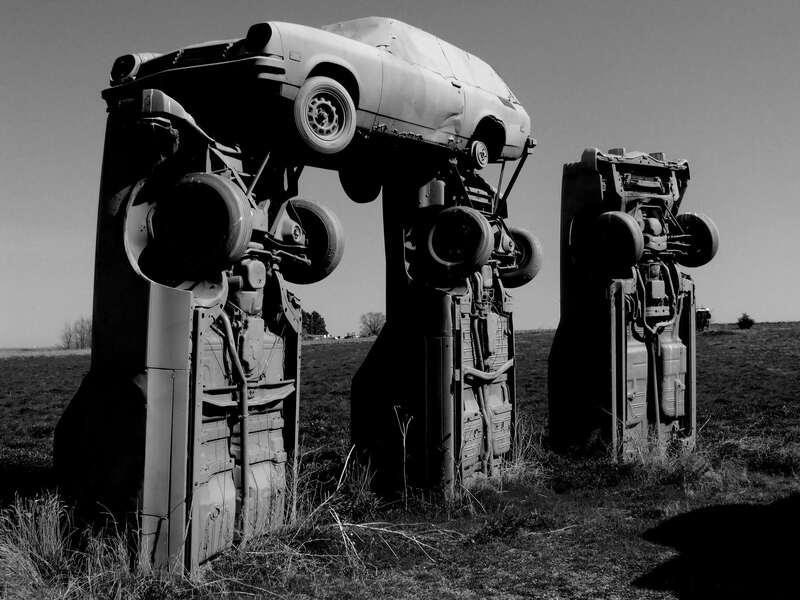 Given the incremental development of autonomous cars and beyond, the monumental Carhenge installation may be more portentous than pretentious. 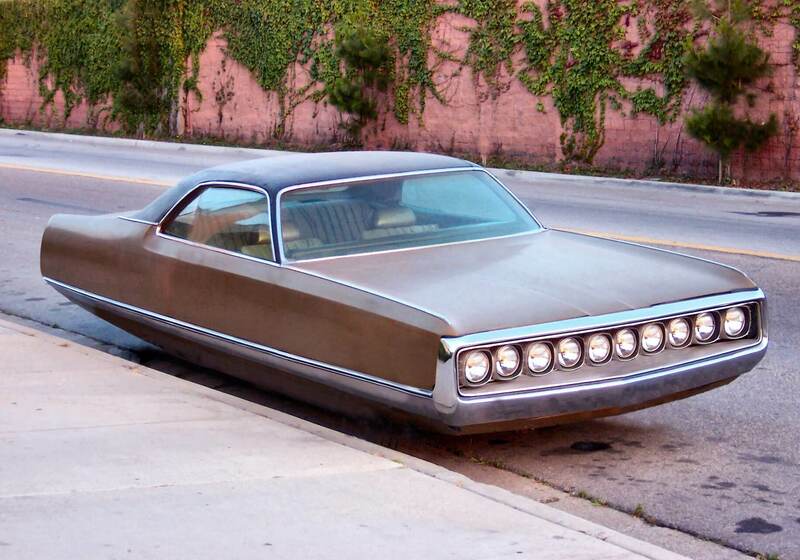 Artist Bischof manages to reference both past and future with his splendid, concept “Meta Cars.” Bischoffs “Untitled Handicapped Car,” seen at top of page, is one of his photo-manipulated retro-fits, this one resembling a hovercraft that would not seem out of place on the set of “Blade Runner,” just before lift off. Several photos in this exhibit pay homage not so much to cars in general but to specific brands and models. Virtually in all cases the setting serves as commentary or augmentation as does the artist’s aesthetic and point of view. Serge Marcel Martinot’s black-and-white image of a Citroën DS 23 driving in front of the Louvre could be described as poetry in motion despite its triptych structure. Shooting it in front of this bastion of beauty and art in such an elongated fashion only enhances the culture’s reverence for unique, classic design, still on the road as well as immortalized in this image. 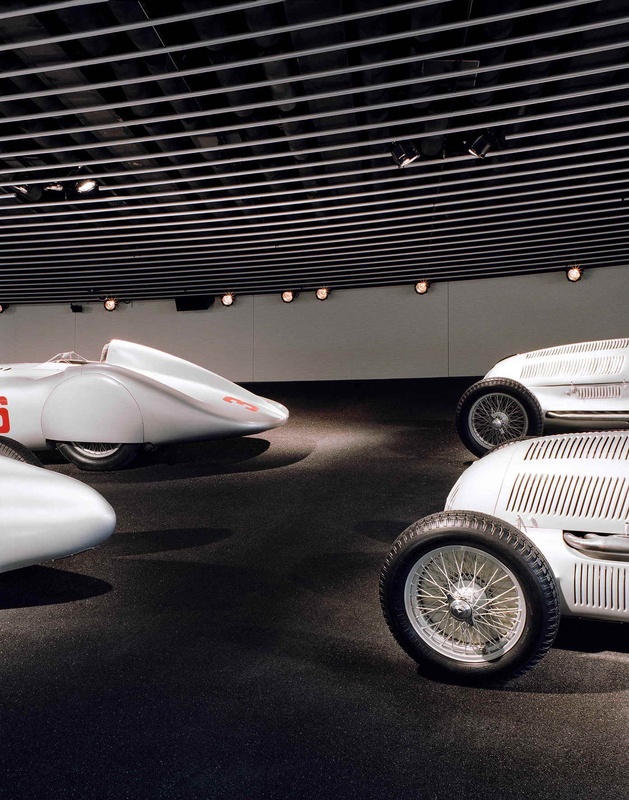 Whereas, in Ralf Meyer’s “Mercedes Museum”, the traditional, petrol racecar, threatened to be a museum piece itself, is rooted in the spotlight of history, never more meant for the open road or track. Meyer reinforces this inevitability by placing his subjects half off-frame and focusing on a dark impending blank space between them. Nevertheless, by doing so, the organic and graphic Mercedes design survives regardless. 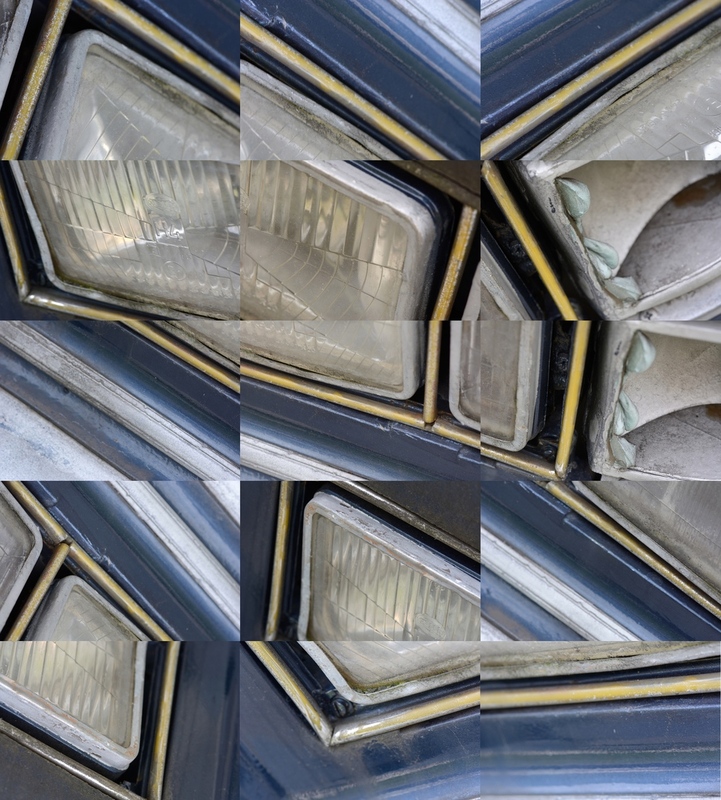 Less representational and an exercise in design abstraction is Jürgen Baumann’s kaleidoscopic image of old car headlights, “Speed Cadillac.” It’s an interesting geometric experiment but somewhat disorienting. A more pleasing example directly above is his “Blasen” or “Bubbles” whose overall impact is as ephemeral as its title. Klimas’ untitled Ferrari-Porsche, model car smash-up is also greater than the sum of its parts, which are frozen first in liquid nitrogen and then shot in hi-speed stop-motion photography, creating an abstract pattern of its own. The oddly pleasing dynamic perhaps parodies auto test crashes as well as car chase films. It may even mock the “who makes better sports cars?” rivalry itself. Many photographers in this exhibit use the auto and its surroundings to tell a story or at least to suggest a possible scenario, some more suggestive than others, but all inviting interpretation based upon what is seen and not just imagined. Most effective is the expressionistic photo “Car-Stop Light Abu Dhabi” of Melina Papageorgiou, whose settings of sun, sand, trees, day and night reflections evoke an atmosphere bordering on surrealism. 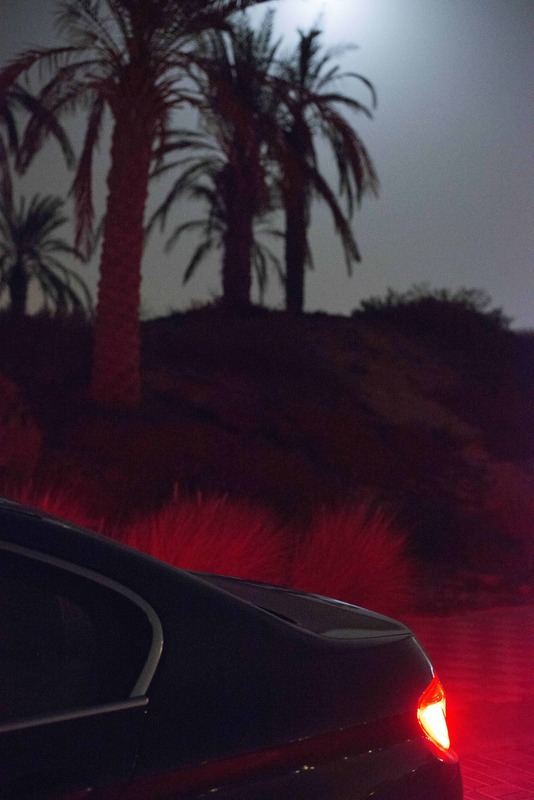 Everything in this mise en scène, from the silhouetted palms to the red ambient light emitted from its even redder taillight source, reinforces the exotic setting and aura of intrigue within the darkened backseat window, always part of a car’s mythos. 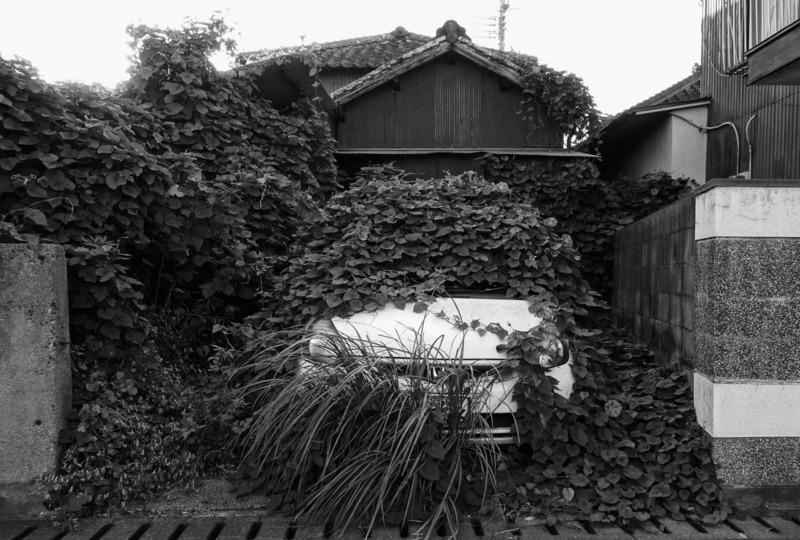 Artist Rothmann is also motivated by mystery in his very verdant “Kyushu Japan,” an unidentified Japanese compact car buried by nature in its own garage. A relic relegated to its own grave, due perhaps to abuse or at least, neglect, or perhaps an auto shrine of some sort? It remains a sublime oddity nonetheless; may it rest in peace. 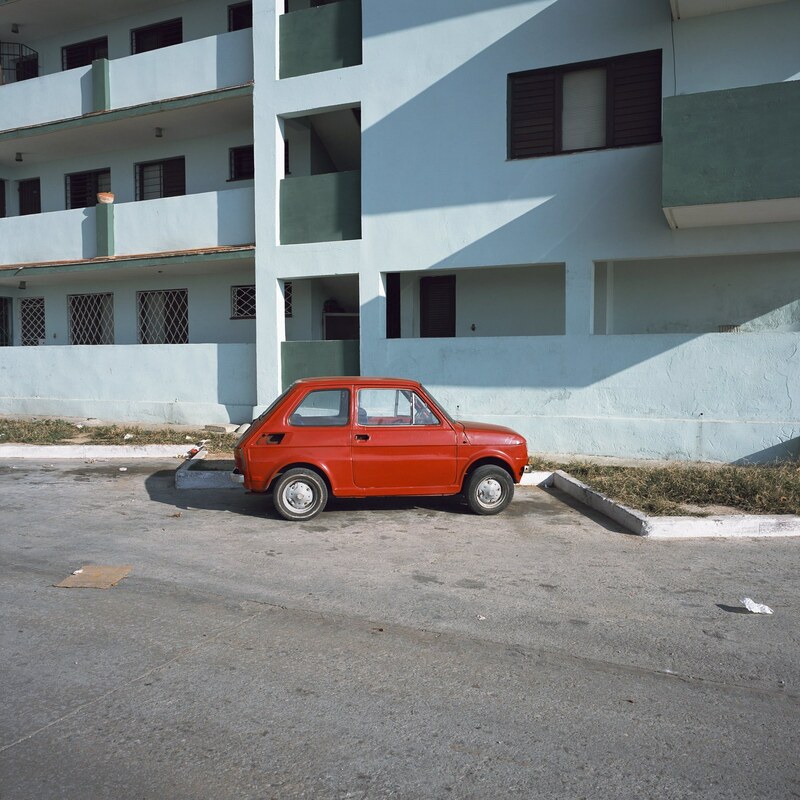 Equally intriguing is Johnstone’s “Little Red Car” in Havana, Cuba. Known for his typologies of empty spaces, such as NY basketball courts, pools, storefront churches and seemingly abandoned buildings, he extends his affection for place to cars, especially those iconic hybrids that have survived in a isolated country with limited resources “driven” to improvise. Working against type, two single images conjure up an entire movie in microcosm; so cinematic is their visual storytelling. Without added text, contrived allusions or symbolism, photo-shopping or special effects, each image “tells” its story with careful composition, natural lighting and deep focus photography. 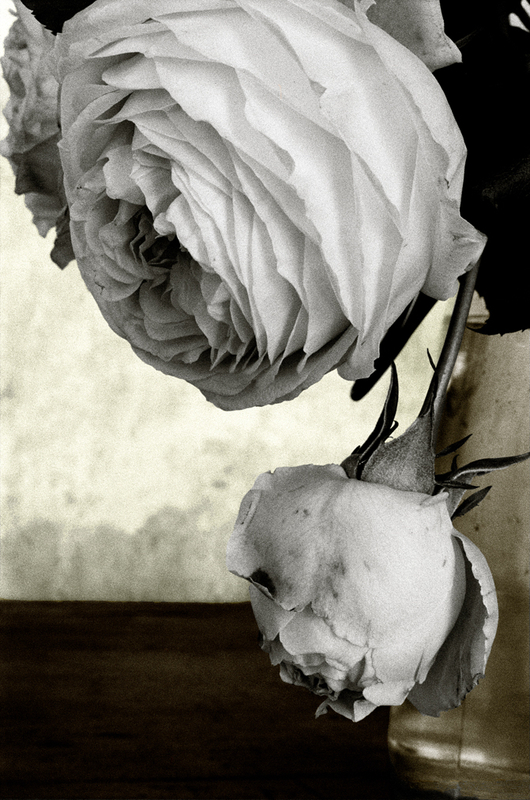 First, we have a deceptively simple black-and-white photo from von Recklinghausen who is one of the founders of lux-fotografen in 1996. Mainly a freelance, event photographer, he has documented, among others, the Serbian Siege of Bosnia in 1992. 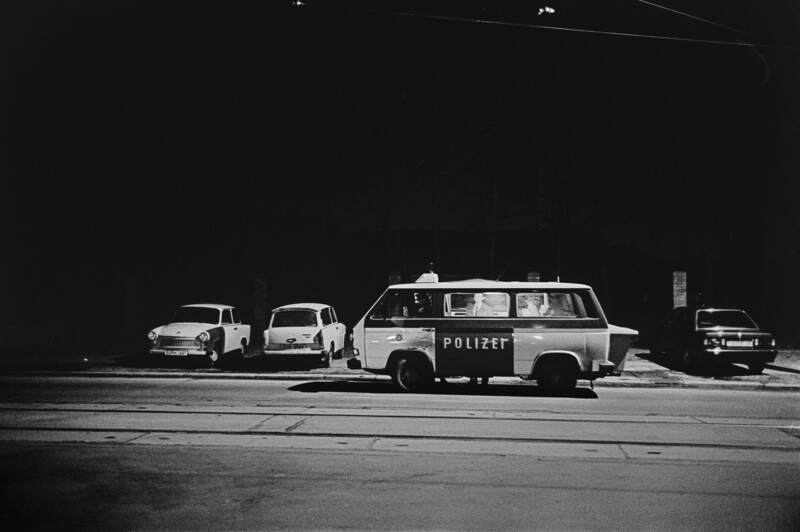 In this untitled noirish setting a VW Polizei van has made a roadside stop while on prostitute/pimp patrol under a garish overhead light. The viewer is drawn out of curiosity but careful to keep his distance. 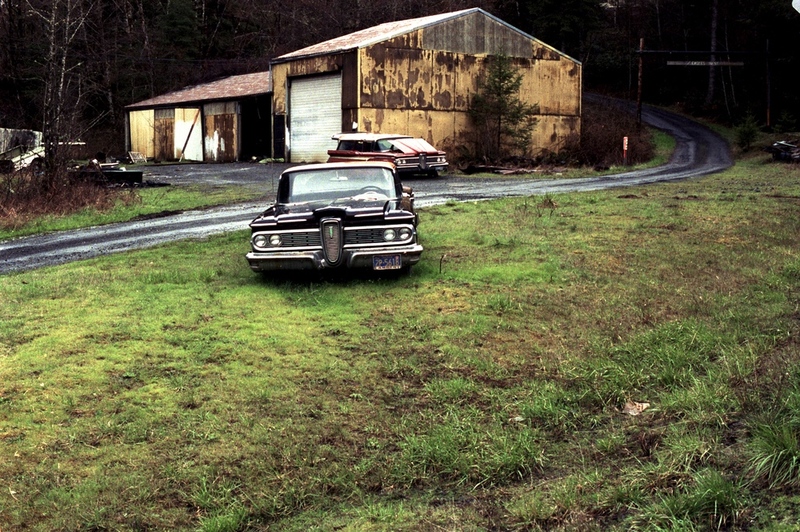 Same to with Witte’s somewhat elegiac, but equally forbidding “Somewhere in Oregon.” The viewer, while looking for a “No trespassing” or “Beware the dog” sign, is hypnotized by two abandoned Edsels in a rural setting that would do “Twin Peaks” proud. Proposed as Ford’s next Model T success, the failed Edsel experiment seems at home in its pasture rusting away. 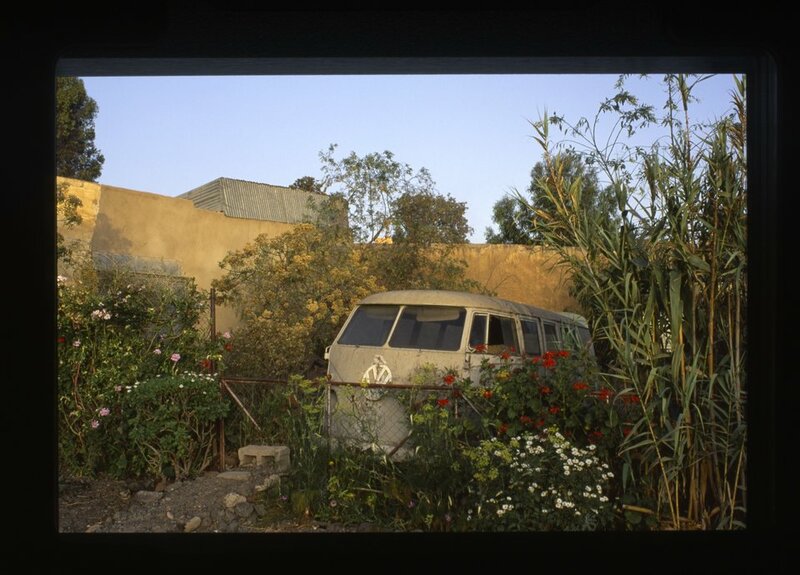 A much happier resting place is reserved for the time-honored Volkswagen (“people’s car”) panel van as seen in this untitled, bucolic image by Stephan Erfurt, founder of C/O Berlin, a foundation that exhibits emerging and world-renowned artists. His image, a paean to the beloved VW vehicle known globally as the Type 2, Transporter, Kombi, Hippie Bus, Camper and Vanagon, is virtually a title piece for this extraordinary exhibit. It can be argued that no vehicle in automobile history has been driven with more adventure, passion, devotion and diversity than the VW Bus. Here it sits behind a Volkswagen garage waiting to be lovingly restored or used as parts before it too finally rusts away in its garland setting. The very fate of the automobile itself is in question and it’s no coincidence that the title of this exhibit moves from the present (Drive) to the past (Drove) to the perfect or completed tense (Driven). Are cars then a done deal? Curator Harder, who will take this show “on the road” next in a world tour, has chosen his artists well. Yet, he wonders too about the sustainability and survival of their subject and its muse. “The selection (exhibition) offers a multifaceted view of society that reveals both a requiem for our car-driven civilization and an ode to our never-ending fascination with the car in its many incarnations,” said Harder who sees at least one stumbling block that may tip the balance to the former. Especially in Europe where Harder says “the car has lost its topmost ranking among the possessions most desired by Europe’s millennial drivers.” Factor in too that England and Germany have already banned new internal combustion cars by 2040 and 2030. DRIVE DROVE DRIVEN opens Thursday, Aug. 9 at 7:30 in the Artists’ Cooperative Gallery, 405 S. 11th Street and continues into mid-September. For details and gallery hours go to artistscoopomaha.com or call 402-342-9617.